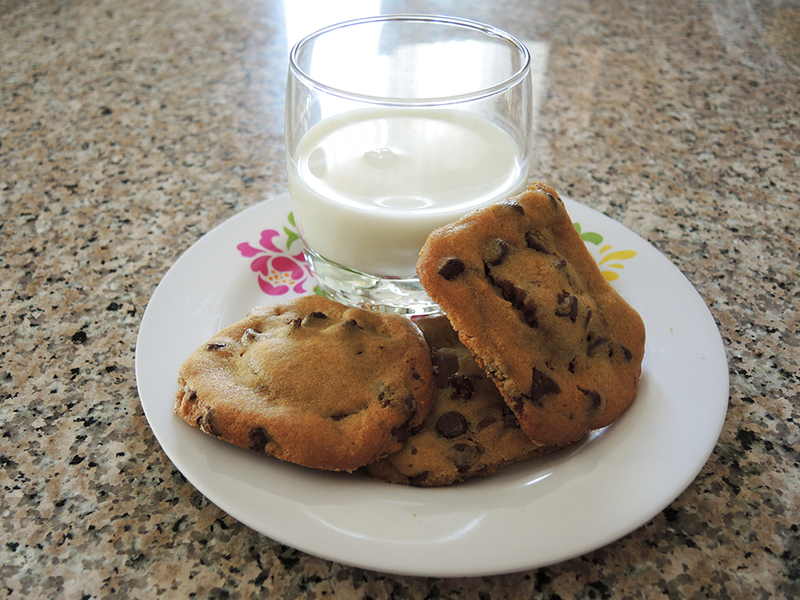 If you love peanut butter and chocolate chip cookies, then this recipe is perfect for you. While it isn’t made from scratch, it does use pre-made ingredients to form an entirely new creation. You can’t beat the simplicity of these cookies, especially during the Holiday Season when everyone is already so busy. They’re great for Halloween, but they also work for any occasion because they’re so easy to make! One quick disclaimer though: I didn’t come up with this idea myself. In fact, I saw a similar recipe somewhere online that used full-sized cookies and full sized Peanut Butter Cups instead of the mini ones I’m using. Why would I go small when I could go big, you ask? Well… it turns out that the normal sized cookies with the normal sized Peanut Butter cups come out to an outrageous calorie amount (something like 285 calories per cookie). My version has half the calories per cookie, but still retains all of the flavor. Makes 20 cookies at 144 calories each. 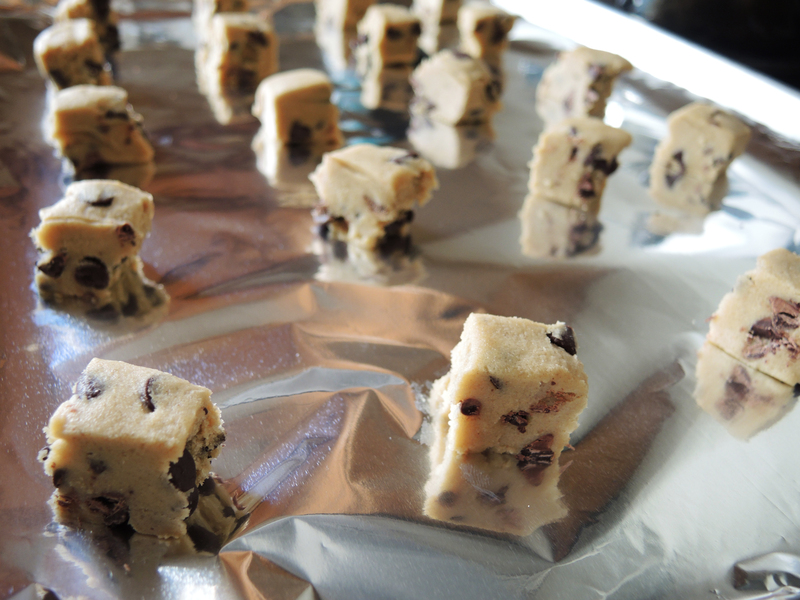 Lay down some aluminum foil on a large baking sheet (if you’re using ready-made cookie dough, you shouldn’t need to grease the pan, but otherwise, spray a little bit of cooking spray on the aluminum foil so the cookies don’t stick). Open 20 mini peanut butter cups and set aside. 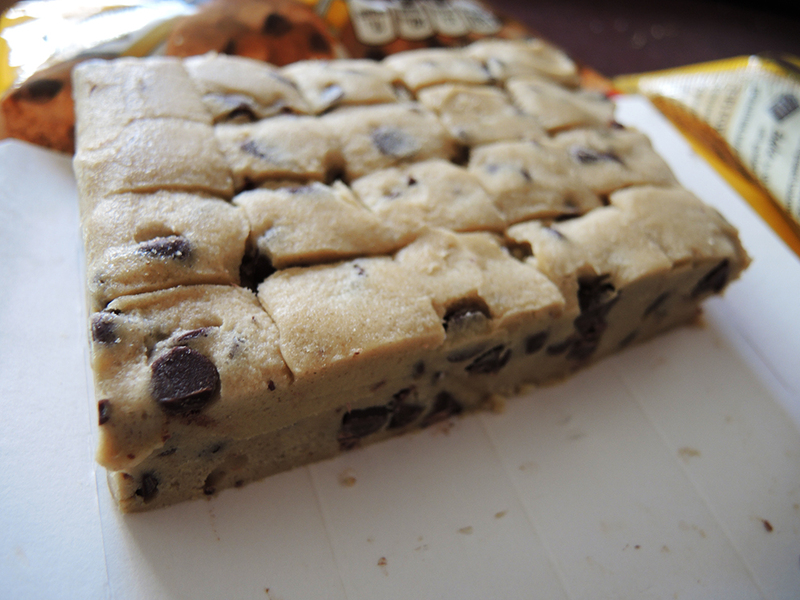 Open the mini chocolate chip cookie dough package and using a knife break apart the squares of mini cookies. 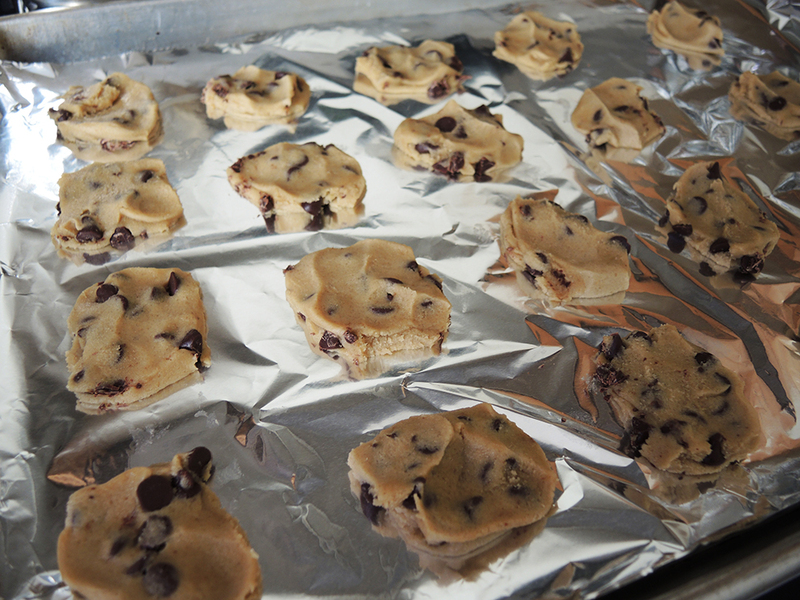 Lay down 10 to 20 cookie squares, evenly spaced on a baking sheet. I’m impatient, so I tend to overcrowd my cookies. 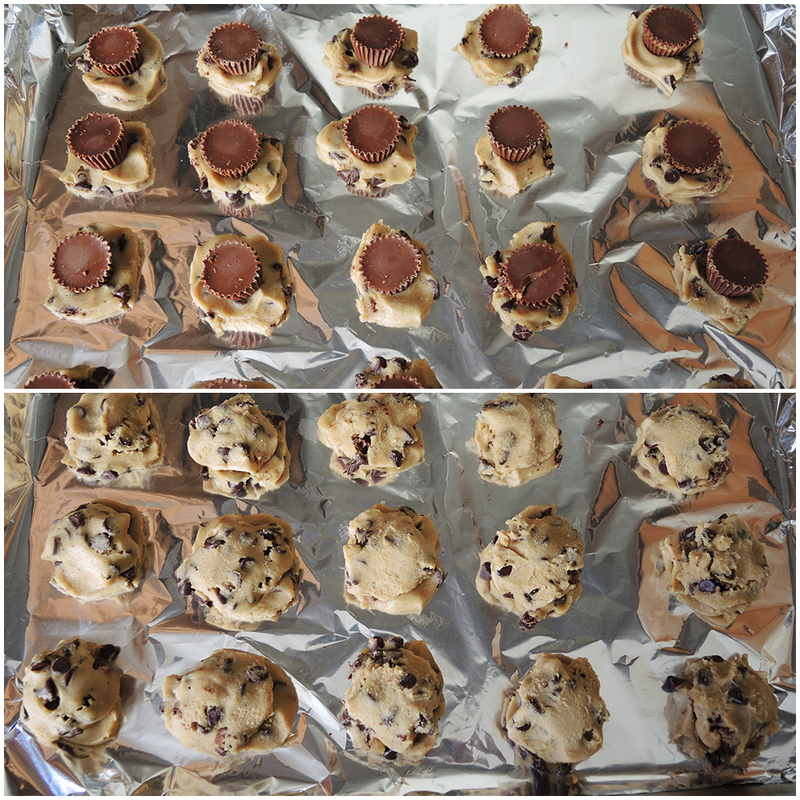 Use two baking sheets or make two separate batches of ten each if you want perfectly round cookies! 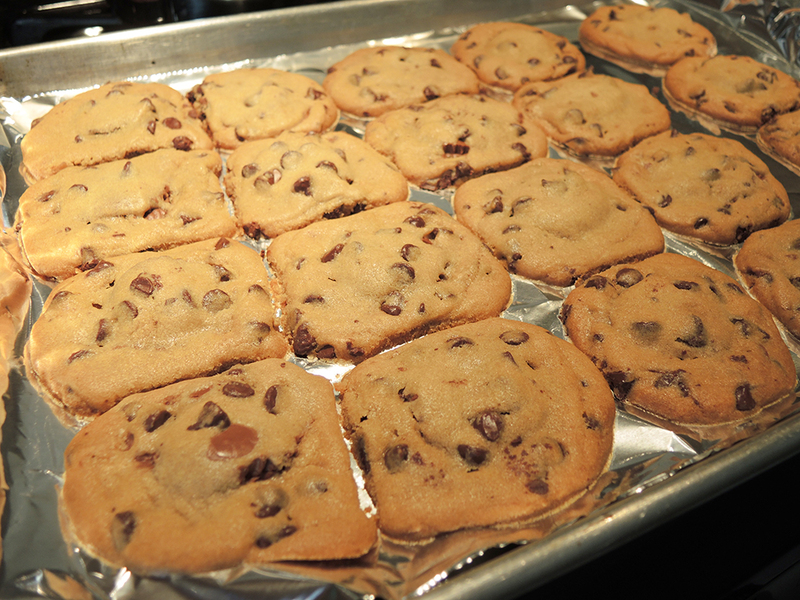 Using your hands, gently flatten the cookies on the baking sheet. I know this goes against the directions on the package, but you have to do it! 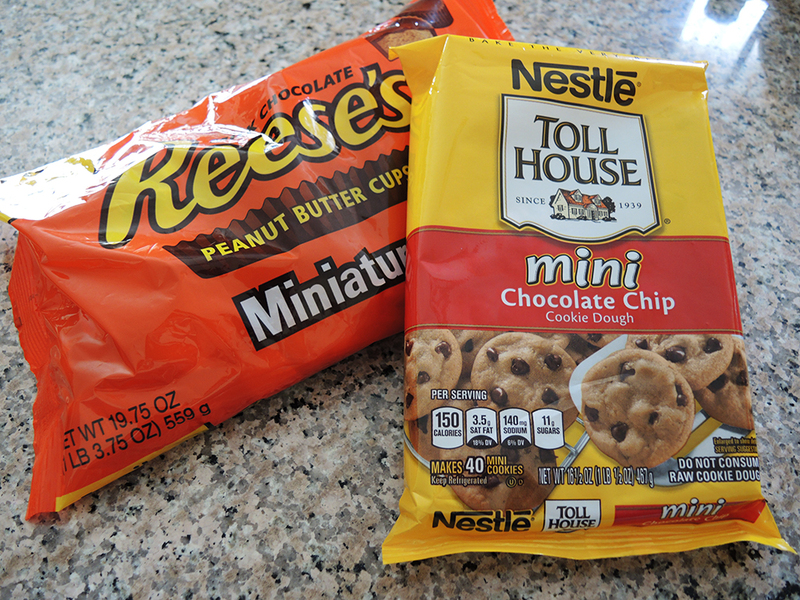 Place a peanut butter cup in the center of each cookie and press down gently. It’s perfectly fine if the peanut butter cups crack or break a little. You just don’t want to push so hard that the cup goes all the way through the bottom layer of cookie. 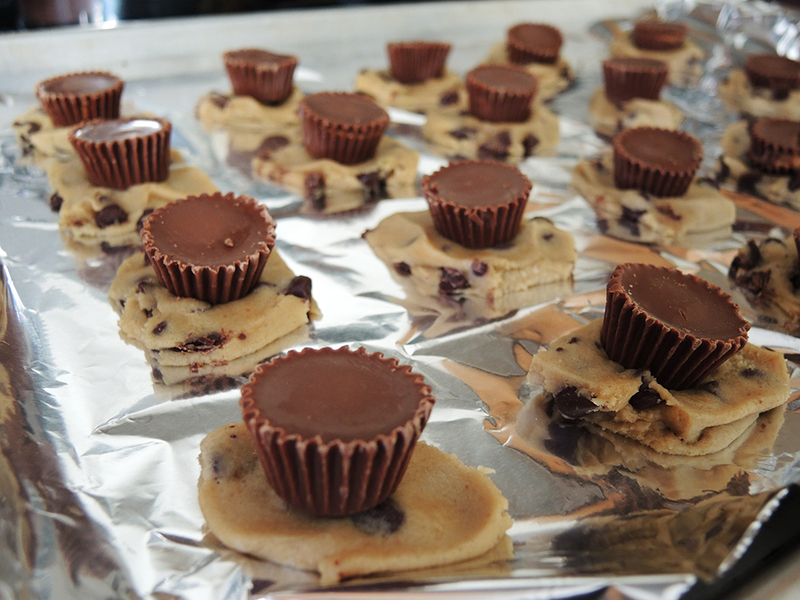 Use the remaining two pieces of cookie dough squares to cover the peanut butter cups. Do this, by gently flattening each square portion in your hands before laying it over the peanut butter cups. You may need to break/squish some of the cups in order to get the cookie dough to completely cover them, so don’t be afraid to do that. 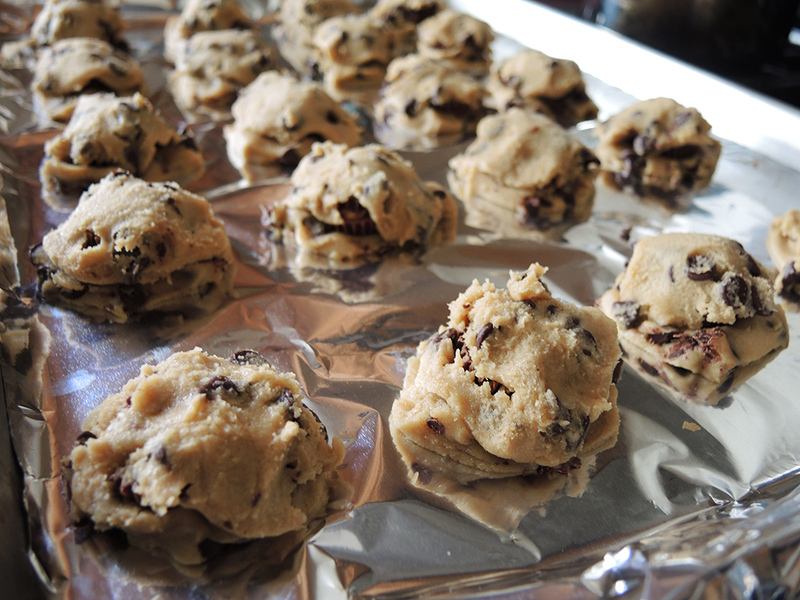 Bake in the oven for 10 – 15 minutes or until the cookies are a light golden brown. Remove from the oven and let them sit to cool for a bit. If you overcrowded the cookies like I usually do, then use a knife to gently separate the cookie edges while the cookies are still hot. After the cookies have cooled, use a spatula to gently remove the cookies and place them on a serving dish or in an air tight container for later eating. Pair these richly decadent cookies with a glass of milk and enjoy!